It was another cold one last night with a bit of condensation in our tents this morning. I’ve been surprised by the wide range in temperatures with it being so warm during the days and cold at night. It warms up in the first hour or so of our hiking, but there’s a definite chill when we start out just after sunrise. This morning, we got going at 7:20am. 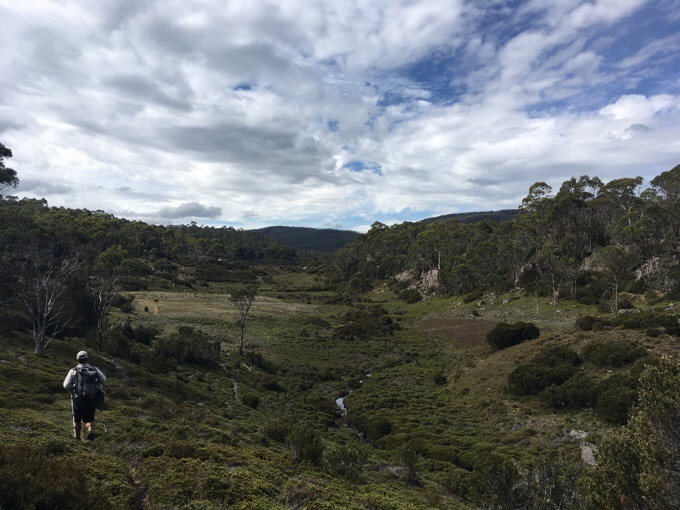 It was just a wooded 3mi/5km stretch on the Overland Track to the Hartnett Falls junction. 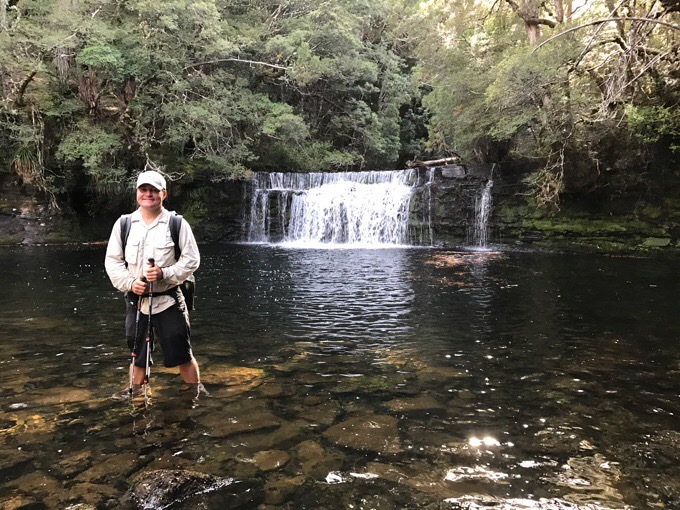 Hartnett Falls is an optional side trip along the OLT, but for us, it is also a way to access Walls of Jerusalem National Park, where we plan to do a 3 day side trip. 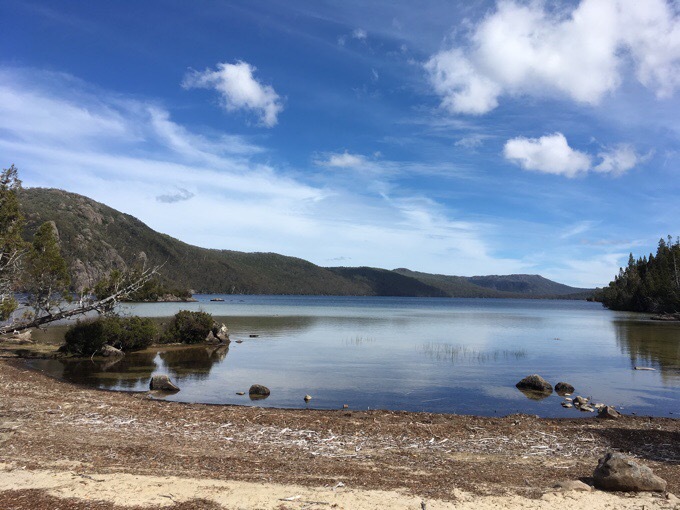 When we did our research, and asked locals the top places to visit in Tasmania, Walls of Jerusalem was always on the list with the caveat that a flood last year closed the main access road to the park. 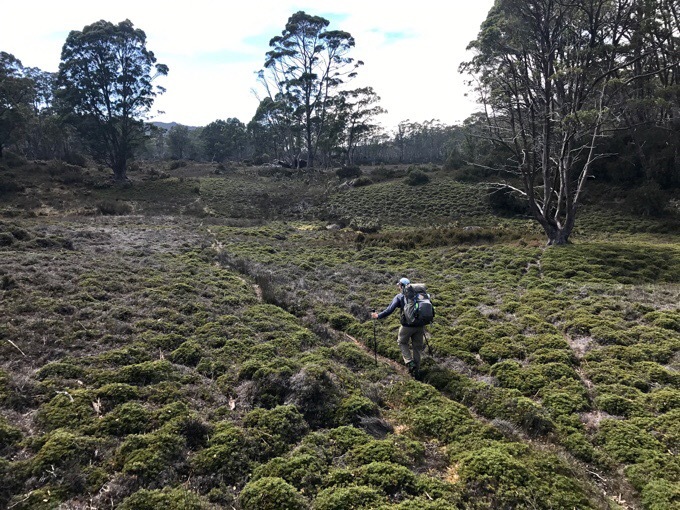 The main guidebooks used in Tasmania are written by John Chapman, and one of his books has the description for how to reach the Walls of Jerusalem via the loop we’ve decided to add onto the OLT. Chapman’s books are darn near impossible to get hands on right now, as they are all sold out with new editions coming in a month or so. I want to thank my friends Catherine and Roger for helping us greatly in this area and for sharing their books with us. They are invaluable and we are so thankful to have adventurous friends who have Chapman’s books. THANK YOU Catherine and Roger!!! Since much of today was off route or on a light use path, we weren’t sure how much time it would take to get to our final destination at the end of the day, so we didn’t go all the way down to Hartnett Falls this morning. We may be able to do it when we return in a few days depending on how we choose to return to the Overland. 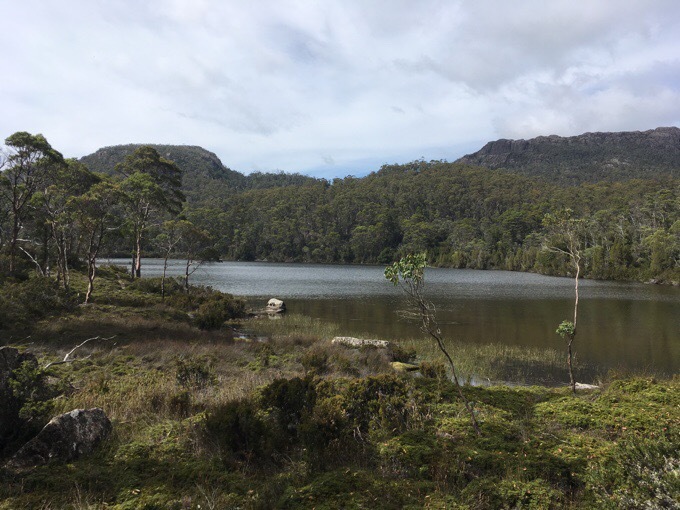 The first thing we needed to do to get to Walls of Jerusalem was to follow the Mersey River upstream through the woods and then through Never Never Valley until we hit Junction Lake where we could pick up a trail. 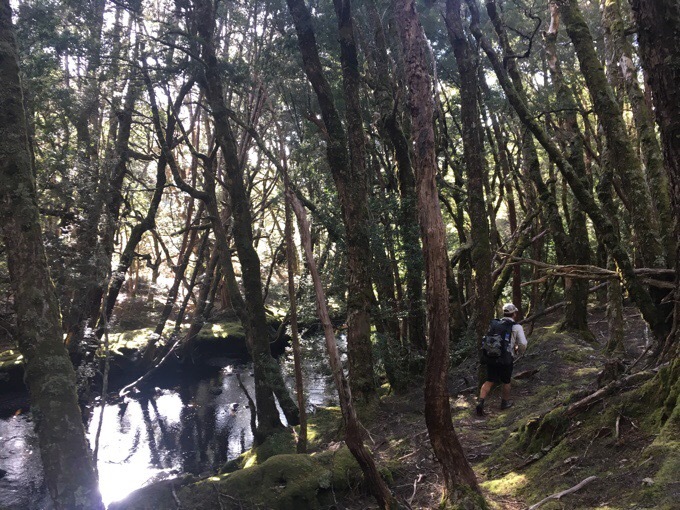 This entailed three hours of varying degrees of bushwhacking that included easy walking on a light use path, all levels of brush to push through, and even just walking in the river itself when it seemed the best option. Not my favorite mode of travel, but it’s a means to an end, and that end is supposed to be pretty great. 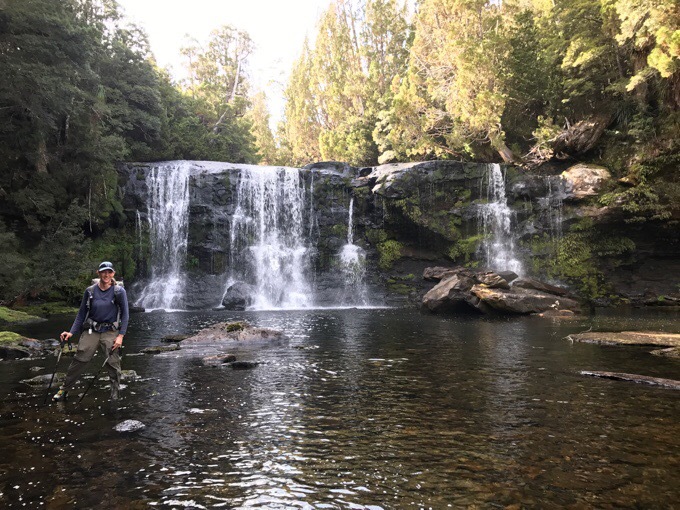 Fortunately, the Mersey River is running low because there hasn’t been much rain the last week, so we got to walk right up to the base of McCoy Falls and a smaller unnamed falls just below it. Magically surreal views. There was a faint path we were able to follow from time to time, and we eventually got to Junction Lake where we ate lunch at the hut. We were surprised at our lack of animal sightings today. The only one this morning was that I briefly saw a wallaby jump across the stream downhill from our lunch spot. Lunch at Junction Lake Hut. 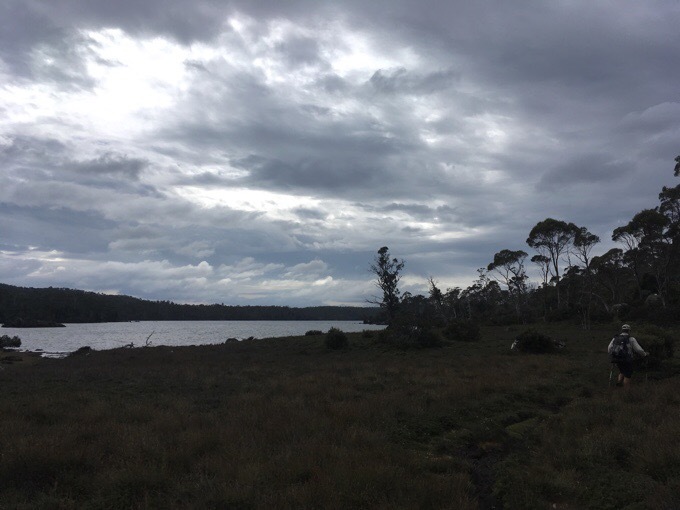 After lunch, it was mostly obscured hiking along Lakes Meston and Adelaide. The path was more clearly defined, but rockier, and still a bit overgrown, so it felt just as taxing. Bummer there weren’t more consistent views because what we did see was really nice when it did open up. Though, given that this is considered a “connector” between two destined places, it was nice to feel like we were off the beaten path a bit. The cool thing is that we didn’t see a single person all day. That hasn’t happened in quite awhile! 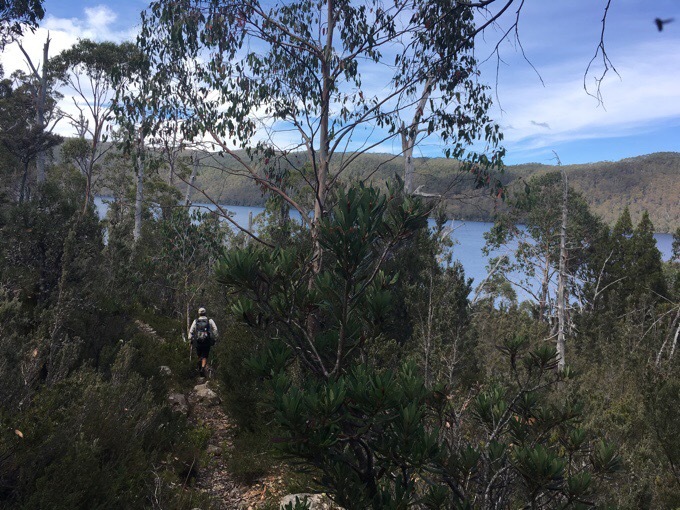 Once we got to the end of Lake Adelaide, our loop through Walls Of Jerusalem officially began. We both failed to notice until it was too late that we unintentionally turned the opposite way on the loop than we intended. 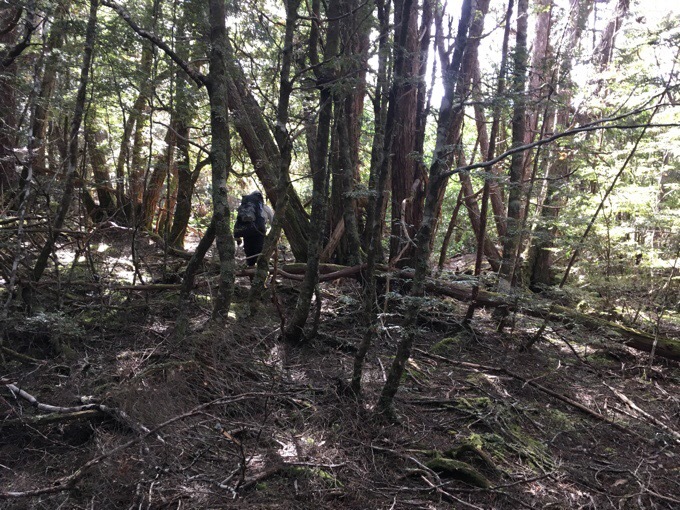 It ended up being ok, and put us at Trappers Hut for the night rather than Dixons Kingdom Hut, which we soon found out will better position us for tomorrow. 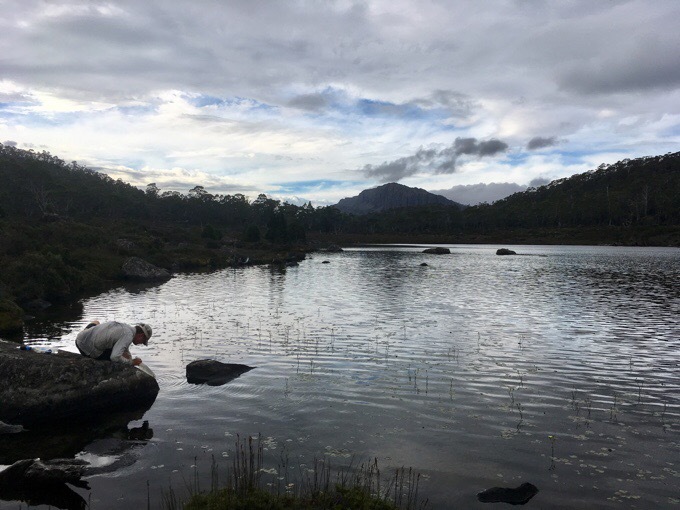 Getting water at Loane Lake before Trappers Hut. We knew showers were expected tonight and tomorrow, so I checked the forecast on my Garmin InReach. It really is such an awesome device to be able to check weather whenever I need. There’s a general forecast charge as one of my allotted monthly text allowance (40 cents each over that) and a detailed premium forecast for $1. Totally worth it the few times I use it. Unfortunately, the forecast changed to be worse than expected. It said the rain would start at 1am tonight and go through the day tomorrow. Good thing we were headed to a hut. 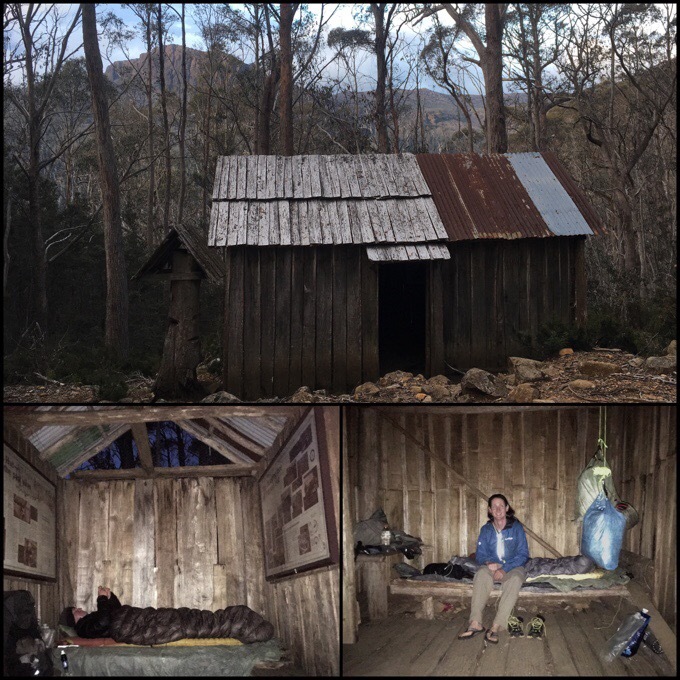 It ended up being the most rustic hut I’ve ever slept in, but it was better than no hut at all. I can’t believe I’m sleeping in here, but knowing cold rain is coming, I’ll take it! I’m super paranoid because I saw a spider on the wall near me, so I keep switching on my headlamp to shine it on the wall to catch others. I switched it on, and like a horror movie, about a yard above my head on the wall was a spider almost the size of my hand just lurking there! WTF!? I made Griggs scoop it up with my stove container and lid and throw it far from the hut. Now I’m totally freaked out, sleeping with no skin exposed, and my bug net on my head. At least if one crawls on me, it can’t get to any skin. Gives me the chills! I can’t believe this was right above my head! 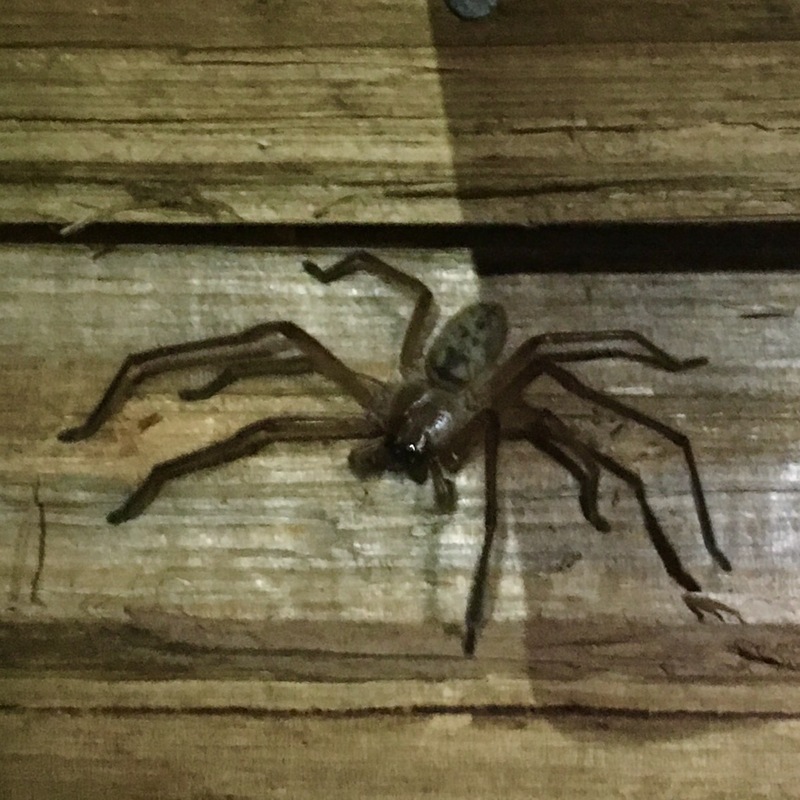 Looks like a possible Huntsman spider. Mainly feed on insects and rarely bite humans. Not deadly if it does happen to bite you. Have a safe journey and thank you for sharing your trips! YIKES!!! I don’t normally get too freaked out by spiders, but that thing looks huge!! Now that you’re back in Oz you might as well learn the lingo. 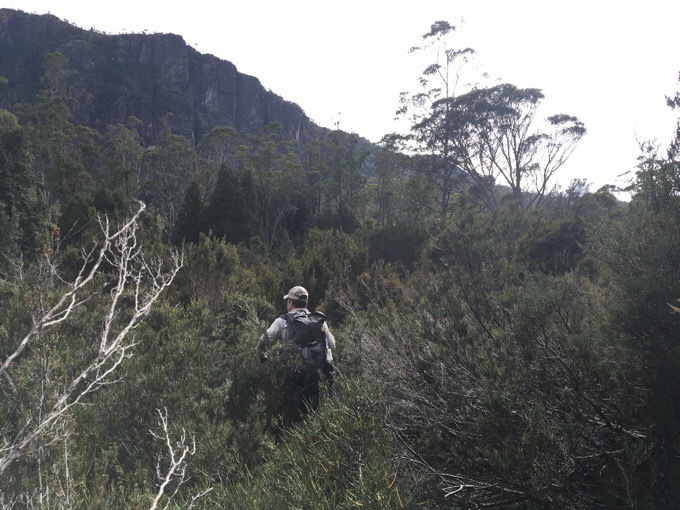 We have no tramping clubs here for we go bushwalking. 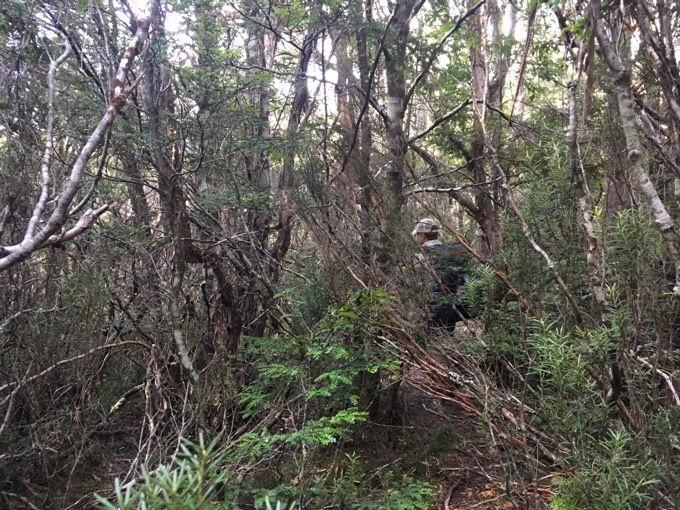 We generally walk tracks, not trails, and if they’re overgrown or non existent we bushbash our way through the scrub rather than bushwhack through brush, perhaps along a pad rather than a use trail. Enjoy your time here! Haha, yes I’ve heard these terms but it isn’t me to use them if it isn’t my native language. That would come off a bit odd. 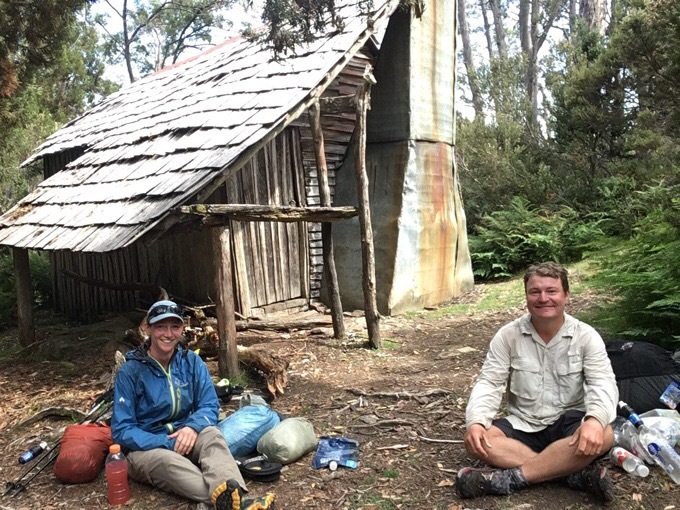 Oddly, the group in the hut did identify as a tramping club. Don’t forget to keep an eye out for snakes Erin and the ones down that way Tiger Snakes and some others are highly venomous. Don’t worry too much about the Huntsman they are pretty shy and probably wouldn’t even bite if you picked it up. My crazy sister in law picks them up to take them out of her house all the time. Eww! Yes we’ve seen a couple snakes that were probably Tiger snakes. Lol welcome (back) to Australia! Get use to the spiders! Not a fan of large spiders, either.. and those Aussie spiders are big ones. Insects and snakes. Not much my thing either. I have never used the forecast service of my (Delorme) InReach. Did you use it also in NZ ? Is it precise enough despite the unpredictable weather in NZ ? Haha, glad to help. Yes, I did use the InReach weather for NZ at times when I didn’t have service to check the weather and I found it pretty reliable. You need to post a warning, I wasn’t prepared that you would actually post a picture of one…that thing creeped me out, gross.